Price / Performance 1 I purchased a round-trip flight to Tanzania from KLM. Eight of my closest friends from school and I had planned a 2 ½ week holiday to climb Africa’s highest peak and to see the other offerings of Tanzania. Despite our advance planning and our reliance on KLM’s claims on its website about its customer service, nothing with KLM went according to plan. On our return, we arrived at DAR for our return flight about four hours before our scheduled flight. We were told while waiting to check in that the flight had been delayed several hours due to a mechanical problem and that it needed to make a stop in Nairobi, Kenya, for repairs. The estimated departure time was moved from 11:35 pm to 2:30am. Around 2:15 a.m., hours of sitting in the Dar airport later, we were told that the aircraft had arrived, but the crew had logged too many hours and the plane was unable to stop in JRO. The plan was for it to fly back to JRO from DAR, drop off the JRO travelers and head onward to AMS, and for a few people bound for AMS from DAR to also board. Those of us whose names were not called got no further information about what was happening. At about 5:00 a.m. we were finally able to collect luggage and were given a voucher for a hotel “nearby” called the Blue Pearl. We were asked to exit the airport and told that a shuttle bus would be waiting. The shuttle never arrived, and we were finally forced to pay for taxis. The hotel was nowhere close to the airport. In fact, we drove 30 minutes across Dar es Salaam, in the dark, with no idea where we were going. Arriving at the Blue Pearl in the middle of the night with no information was made no more assuring by three locks on the doors of the room. We received no email or call from KLM, and we were given no information about how or when we would be leaving DAR until midway the following day. A KLM crewmember eventually came to tell us that there would be multiple different routes, but she could provide no definite information about who would be on which flights. Intermittently through out the day this KLM representative called out names of those who would be shuttled to the airport. 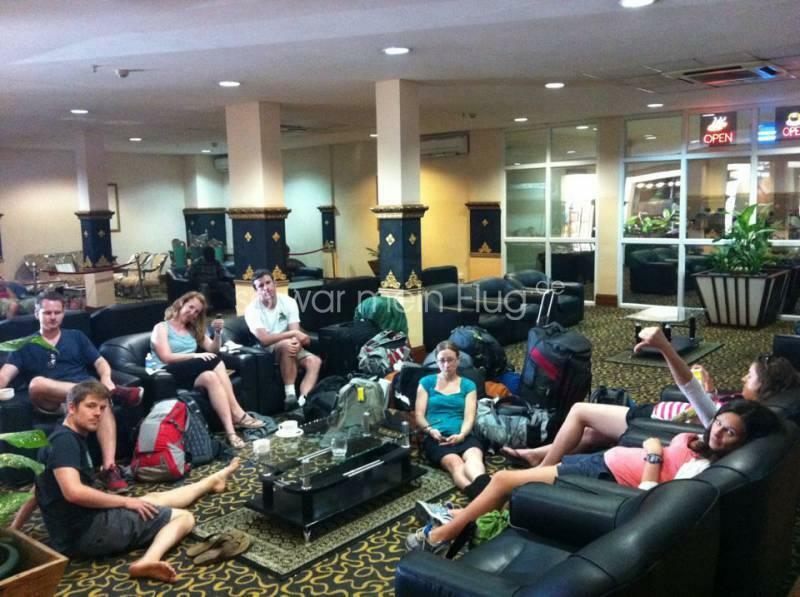 As you can imagine, we experienced a great deal of stress being confined to a hotel in Dar es Salaam with no information about when or how we would get home. Finally, our group was split up into three different routes. We all arrived home over 36 hours after our scheduled arrival time. As a result of the canceled flight and delayed return, we missed an additional day and a half of work, and suffered through a more than 60-hour trip home, almost a full 24 hours of which were spent in uncertainty about when and whether we would be leaving Africa. This delay came in addition to the over 12 hour delay that we experienced on the way to Africa. We received multiple emails prior to our departure informing us of changes to our flight plans by only a few minutes in either direction; however, when we were in Dar es Salaam stuck for hours we were never once informed about the delays or cancellation. Our 24-hour planned trip home took more than twice that amount of time, and we were given no warning, no apology, and absolutely no acknowledgement from KLM at any point in the process that anything was amiss. To date, over a two months after we finally arrived home, we have received no communication from KLM of any kind, neither to express apology nor rightfully and fairly compensate me and the others for the stress and delays caused by KLM’s utter negligence and complete ineptitude.